Paul Bowyer, a keen amateur of Parramatta history, gets an idea for a Heritage Ride. Paul starts leading a community heritage ride with CAMWEST, and we get good responses. (You can join us for the next one, see CAMWEST Heritage Ride). Paul, Rob, and Marty think it'd be great to have a web site and download tour guide, but Marty never gets round to develop it. We win the Parramatta City Council grant. The grant is presented by Mayor Julia Finn on a ceremony at Granville. We have our first meeting and Marty starts developing the resources. Marty develops the site with various releases, contributions and checks by other CAMWEST members. Viewing the War Memorial at Parramatta's Town Hall in the 04 Heritage Ride. Paul is a keen fan of the history of the Parramatta area. He first got the idea of a Heritage Ride. He did the search and descriptions for the site. 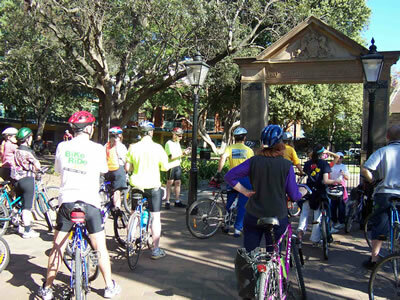 He has also been involved in improving cycling with Parramatta City Council. Rob is CAMWEST's Secretary and has worked with Parramatta City Council to improve cycling conditions. Rob prepared the grant application and sought support from various community groups. Marty is a web designer and developer who specialises in Educational Media. He designed and developed the Heritage Ride web site and brochure resource. He also produces CAMWEST's website. He enjoys a 10 minute bike ride to work, and also does some cycling for fun. The following references and sources were used in the production of this website and brochure. We recommend you look through these if you'd like to learn more about Parramatta's rich history. CAMWEST is a group of dedicated cyclists who work with local Councils, the RTA and other bodies that provide for cyclists in Western Sydney. CAMWEST has played an integral role in the development and implementation of many projects, including the Bay to Mountains Cycleway, as well as the Hawkesbury, Baulkham Hills, Parramatta, Bankstown and Blacktown Bike Plans. Other achievements include: Cycle lanes, stand up lanes and smooth sealed shoulders on main roads. We have many social rides, like the Tizzana Winery Luncheon Ride, and the Bay to Mountains Ride but advocacy is our main focus.